The Hunted One Year Anniversary Competition! ​Whoop whoop!! It's been a year today since The Hunted came out! :D so I thought I'd do a little giveaway for the fans to say THANK YOU. You are awesome, every one of you (yes, you)! 1) Who is your favourite character and why? 2) What was your favourite part of The Hunted/The Forsaken OR why do you love the book? *ONE winner will be randomly chosen. Competition closes on Monday April 4th at 5pm EST. 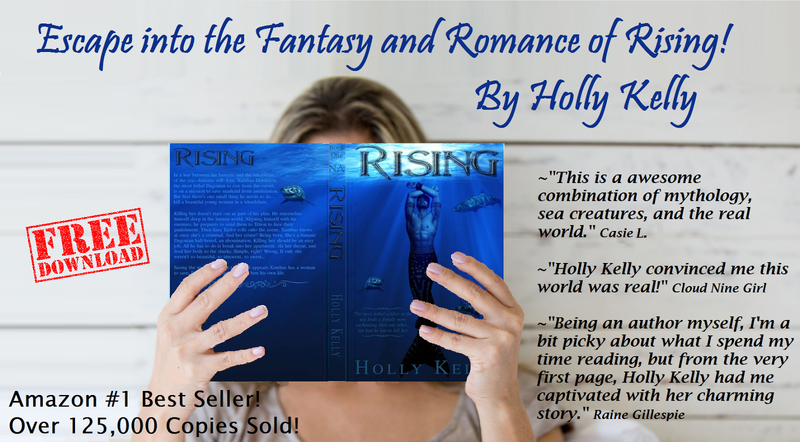 Start The Rising Series For FREE!!! I was born in Utah but moved around a bitâliving in Utah, Kansas, Texas, and Hawaii. Hawaii was my favorite place to live. I absolutely adore the ocean and would love nothing better than to live close to the shore again, but alas Iâm back in landlocked Utahâbut my husband and I have aspirations of someday buying a winter home in Fiji. Itâs funny, but Iâd never considered writing fiction until nine years agoâwhen I started writing my first âpractice novelââI actually wrote three of those. And no, they will never see the light of day. That ship has sailed. Why did I begin writing? Well, Iâd always been an avid reader, but it never crossed my mind that I could write a book myself. Then eight years ago, I read something Stephenie Meyer wrote. It was rough, it was uneditedâit was a scene her publisher cut from Twilight. When I read it, I thought it was horrible. And then the thought struck me. I bet I can write better than that. That moment, I opened up Microsoft word and started writing. I didnât think it over. I didnât plan it out. It was an impulsive thing. But then, once I started writing, I couldnât stop. And when I wasnât writing, I was imagining scenes in my head, thinking out characters, and basically spending my time in the world I was creating. And this is how I live even nowâalways with one foot in the real world, and one foot in the world of my imagination. My first book was a mishmash of everything Iâd been reading. But my first published book, Rising, was something special. I actually got the inspiration for Rising from a picture. It was a picture of a mermaid, but this mermaidâs tail was unlike any Iâd seen beforeâit was flesh colored. And it got me thinking, what if a mermaid was born on land, but she didnât know she was a mermaid? She simply thought she was horribly deformed. That day, I started writing. This is a really hard question! I simply love booksâparanormal, fantasy, contemporary, romanceâ¦ there are just so many. Itâs easier to say what authors have influenced me. My favorite author is Amy Harmon. She writes mostly contemporary and a few paranormal. Her books are powerful! Iâve never read an author who has more heart than Amy Harmon! With her books, you laugh, you ball your eyes out, and you become so involved with the characters, that you literally feel you are inside the story. Some of my other favorites are J.K.Rowling, Sherrilyn Kenyon, Julie Garwood, Janet Evanovich, Stephenie Meyer, Brandon Mull, and Rick Riordan. Iâve got two projects right now. Iâm currently working on a new book called Cursed by the Fountain of Youth. Itâs a paranormal romance with a crazed, murdering lunatic; ghosts; forbidden love; and the curse of eternal youth. And then next book introduces a twisted version of The Legend of Sleepy Hollow. This one comes from my love of all things Halloween. Itâs a spooky story with witches, headless horsemen, severed heads, and a Beauty and the Beast-style romance. For those who are aspiring authors, donât let anyone tell you that you canât do it. I heard it all myselfâeven from close family members. I heard I would never get published, and that I would never write anything people would want to read. I didnât believe it, and you shouldnât either. Use criticisms as a springboard. Prove those naysayers wrong! Itâs not an easy journey, it will take time and a heck of a lot of writing under your belt to get there, but you can. If you just move forward and never give up, you too can become a published author! A terrible tragedy forced Alana McCarthy to forget a year of her life and now she is to be executed for a crime she does not remember committing, the murder of her entire family. Lost and alone, Alana is terrified of unlocking secrets buried so deep inside her mind that she's willing to forget the one person who could set her free. Daniel Costello hasn't forgotten about Alana and will do anything and everything to protect the girl he loves But first Alana needs to unlock her memories and find out the truth about what happened the night her family were killed. The day of her execution is set. Together, will Alana and Daniel be able to uncover the truth behind her family's deaths before it's too late? ​Do you read for pleasure from the same genre you write in? Yes! I love YA dystopian, paranormal, fantasy novels. It takes a very special book or author to drag me from that genre! Do you have any interesting writing quirks? Rituals? When I’m getting ready to start writing, the first thing I have to do is compile a playlist with all the songs I think suit the book I’m writing. All my playlists are available on my website! www.susanharrisauthor.com. Another must have for me is pens in every colour and a refill pad to make notes. I also write up character profiles in case I forget a character’s eye colour or something like that. What would you be doing right now if you were not an author? That’s easy! Either a criminal profiler or a personal assistant for Dave Grohl or Jared Leto! It differs depending on life and pesky work, but most of the time it takes me three to six months to write the first draft. Do you listen to music while you write? Oh hell yes! I can’t even type a word without it. Music helps me concentrate and dull out then background noise. Music is such a major part of my writing ritual that I used song lyrics for the chapter breaks for Shattered Memories. Do you have tattoos? Piercings? Do you have a favourite television series? OMG! That’s such a long list! I know I’m going to forget some but here goes: The Walking Dead, Game of Thrones, Supernatural, Criminal Minds, Agents of Shield, Arrow and The Flash, The 100, Madam Secretary, Quantico, Shadowhunters, all of the Chicago’s, SVU and Blue Bloods. What are your current writing projects? At the moment I am about halfway through writing Collateral Damage, the sequel to Skin and Bones, which is my new fantasy adult series called The Ever Chace Chronicles. Easter Sale: The Forsaken is just $2.99 this weekend! If you've been waiting to one-click The Forsaken (the Abandoned series #2), or want to share the love by gifting to a friend, it's just $2.99 this weekend! After all, books last longer than chocolate ;) so why not give a gift of a book? Fear. Uncertainty. Wonder. Those three things are thrumming through me, pounding in my ears and coating my tongue with acid. All words that escape my mouth are wrong; I can't explain how it feels to not remember—for chunks of my memory and hours of my night to have been erased. Erased? No… forgotten. How do you forget whether you killed a person or not the night before? Cassie Spencer's human life is over, and the resulting consequences are flooding in. As she learns to adapt to her new life, pieces of her honorary family are unravelling. Every day is another spent worrying who Ash will take from her next. Though he's not the only danger she should be concerned about. A man turns up dead. Eaten. The Hunters suspect Ash is behind it—one of his sadistic games. But who is really at fault? And then there's the mystery illness Cassie contracts, a disease unheard of by both her father and the elders. Can they find her a cure before her condition worsens? Not every hero wears a cape. Some wear gray beanies. Haven't started the series yet? Grab The Hunted for FREE! Just your average boy-meets-girl, boy-kills-people story. Visiting Faythander is a nasty business. Forget the fairies and unicorns, most people come back with lost memories and mental problems. Olive Kennedy knows. She's the therapist who treats patients suffering from Faythander's side effects. Despite her empty bank account, she takes pride in her job as Houston's only Fairy World medical doctor. She's never failed to cure a client--until now. Everyone please welcome Houston’s only Fairy World psychologist, Olive Kennedy. Dr. Kennedy has a medical degree in psychiatry. Since graduating medical school, she spent a year doing research in Boston, and now lives in sunny Galveston, Texas, where she counsels her clients who have mental abnormalities. Moderator: Olive, can you tell us how you made your career choice? Olive: Yes. After living on Earth for several years, it was apparent to me that there was no treatment for patients who’d visited Faythander and returned with no memories. I would meet people suffering with depression or some type of psychoses, and realize that they’d been to Fairy World. Also, many of the people collected fairy world figurines of some sort or another, which clued me in that these people were true Fairy World travelers. I did a year of research in Boston where I crafted my laptop box, and where I developed my methods for diagnosing patients. My mentor, Dr. Hill, helped me to accomplish this, although I still have yet to convince him that Faythander exists. After I moved away from Boston, I set up my practice in Texas where I’ve been helping my clients ever since. Moderator: When you’re not working, what do you do for fun? Olive: Talking walks (but not on the beach! ), reading, and knitting. I enjoy making something from almost nothing, and it takes my mind off my problems. I know I don’t fit the stereotype, but there are some days where I would much rather sit at home and knit. My cat is also appreciative of my hobby, as he has proclaimed himself the master of my yarn basket. Moderator: If you could visit anywhere, where would you go? Olive: There’s a lovely fortress in Faythander up in the mountains that I wouldn’t mind going back to. Moderator: Favorite color? Sports team? Animal? Olive: Color--red—because it’s my natural hair color. Sports team--? No idea. What are sports? Animal? Cat, or dragon, depending on which world we’re speaking about. Moderator: Do you have a favorite book? Olive: Do I have to choose just one? I guess I’ll have go with The Dragonsmith (a Faythander novel, so don’t try to find it at your local B&N.) My step-father read it to me as a kid, and it brings back fond memories. Moderator: What advice would you give to those struggling with depression? Olive: Get help. You’re stronger than you think, but you can’t do it alone. Depression is a nasty disease. It’s worse than any illness you can catch, because it brings you to a dark place, and those feelings of sadness can become so overwhelming that many people choose to take their own life rather than suffer anymore. My methods are designed for those who’ve visited Fairy World, but there are many reasons for depression, and the only way to get treated is to talk to someone. Do not try to go it alone. When you’re depressed, your brain has trouble handling even simple situations, so it’s best to get treatment. Moderator: What’s one thing about yourself that’s quirky or different? Olive: Just one thing? Let’s see—I hate coffee. They didn’t have it on Faythander, and it tastes absolutely disgusting if you’re not accustomed to it. I much prefer a steaming mug of hot cocoa with whipped cream and peanut butter. Hey, don’t knock it till you try it. Moderator: Do you consider yourself a hero? Olive: No. I’m an ordinary person. Others might call me a hero, and I wouldn’t want to disappoint them, so I probably wouldn’t argue, but I have faults just like everyone else. Moderator: Is there anything you want people to know about you? Olive: I love to laugh. Sometimes the best cure for gloom and doom is laughter, and I try to bring humor into tough situations. Also, I’ve heard through the grapevine that some of my heroics have been recorded. I’ve read the book and it’s wildly entertaining, so if you get the chance to pick up Dreamthief, I am sure it will add a little laughter, a little adventure, and a lot of fun to your otherwise ordinary life, which, I believe, is why the author wrote the book in the first place. When Tamara isn't writing or tending her children, she enjoys taking walks through the woods, eating chocolate, and very infrequently, she enjoys a good night's sleep. Sign up to Tamara's newsletter. After sixteen years on the run, Bay-Lee joins her emotionally distant father at his New Zealand school. On her first night there, he dumps her on the doorstep and walks away. Big surprise. Minutes later, a bag is thrown over her head, and she’s kidnapped for Orientation. The hunter in charge calls her Bait. According to him, that’s all she’s good for, to be used to draw out monsters for experienced hunters to kill. Connor vacated the couch long enough to take the knife from her. He tossed it on the coffee table. It landed between his sawed-off shotgun and his .38 caliber. “This is a story of heartbreak. Of hope. Of finding your way after everything has shattered, and maybe even letting go of the echoes of the past.” — Kristen Jett, Pen And Muse If only Allie Collins could go back to that tragic day one year ago, perhaps she could escape the guilt that haunts her. In reality, there was no altering her cousin’s death or the role she played. Then she meets Damien Michaels, a dark-haired stranger on a dirt bike, who seems to watch Allie and know more about her than he should. Veiling his own secrets, including a mysterious scar and unexplained tattoo, Allie knows she shouldn’t trust him—especially as she digs up a past Damien desperately wants to forget. She also doesn’t believe in summer romances, yet she finds her attraction to him growing beyond his striking grey eyes. Unfortunately, Allie discovers too late that he is hiding a dark past which is far from over, endangering her life and those she loves. Lingering Echoes is book 1 in the series. Can be read as a stand alone. 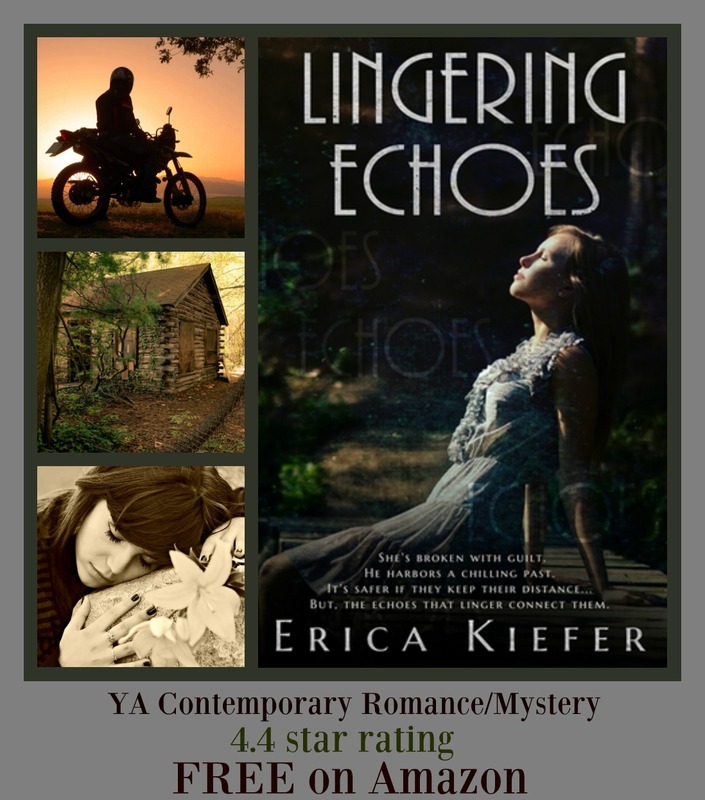 Erica Kiefer’s debut novel Lingering Echoes was published by Clean Teen Publishing in November 2013. She continued the series with Rumors (A Lingering Echoes Prequel) and her newest release Vanishing Act. All of her books can be read as stand-alone contemporary YA fiction, touched with romance, emotional drama and suspense. 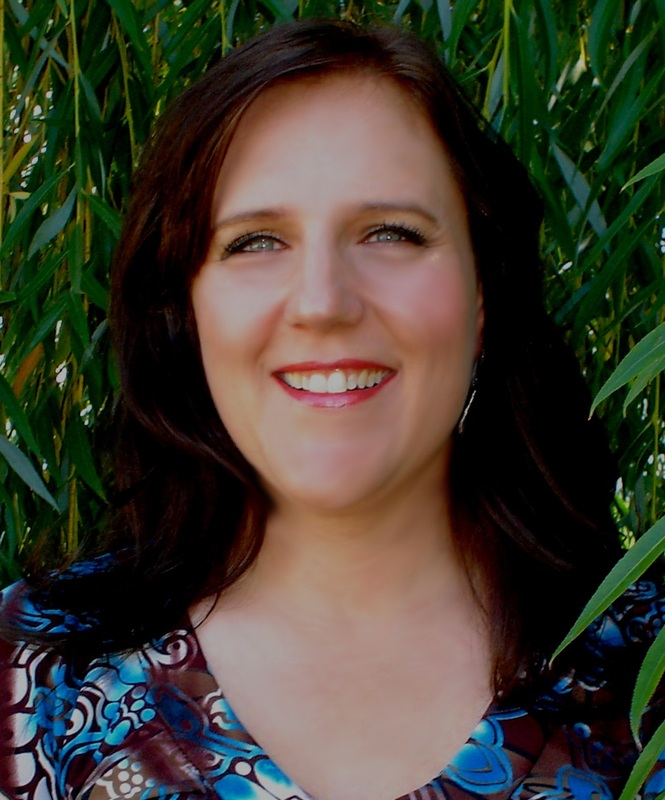 With a degree in Recreation Therapy from Brigham Young University, Erica’s experiences working with at-risk youth have influenced the realistic and relatable nature of her writing. Her first inspirational non-fiction entitled Borrowed Angel (published in April 2014 with Currawong Press) describes the loss of her infant son and her journey towards healing. I have lived in five countries including the United States, Taiwan, Fiji, Thailand, and Indonesia. My mother is from Thailand and my dad from the US. Sadly, I am not biligual. I am horribly, embarrassingly ticklish on my neck, a fact my family has abused since childhood. Soda and candy do not tempt me, but baked goods like chocolate chip cookies do! Waffles and crepes with berries and cream will win me over any day. I chose a fancy, scrumptious waffle over a birthday cake this year. Yum! 2nd grade was the year I decided to be an author some day. Ten years of marriage has given me four beautiful, crazy children ages 4, 3, 10 months, and one son in heaven. My husband says right before I crash at night, I get silly hyper for five minutes and then I'm out! USA BEST BOOK AWARDS (2014) AND INTERNATIONAL BOOK AWARDS (2015) FINALIST. What is the biggest influence/interest that brought you to this genre? I always wanted to be a writer, but after high school, I let my creative writing go, trading it in for the world of business, which was in some ways still creative, just different. When I started discovering the early indie writers on Amazon, like Amanda Hocking, that’s when I first thought that I could do this too, if I just put my mind to it. What were you doing five years ago? Five years ago, I was working through revisions on Never Forgotten, my first book. Never Forgotten took me five years of on and off writing and revising. The remaining books in the series were about 9 months each. I am not a fast writer, and I do not write every day. I find that it does me no good to force my writing; I’ll just end up junking those pages. When writing a book, what is your favorite part of the creative process (outline, plot, character names, editing, etc)? My favorite part of writing a book is when I finish the first draft. It’s such a sense of accomplishment. My favorite part that has little to do with me is when I get to see the cover art for the first time. It’s so exciting! What is your favorite thing to do on your day off? What day off? I kid, but not really. I work full time during the week and fit my writing in around the rest of my life. Between writing, blogging, and promoting my books, I don’t have a lot of free time. When I do, I like to shop or hang out with my family. I’m revising a dystopian short story that was the result of being a finalist in a Utopia Con/Little Bird Publishing contest. I’m writing a contemporary romance short story with a breast cancer theme that will go into a fundraiser anthology to raise awareness for breast cancer research, and I have started two new books that are very different from each other. One is a clean young adult fantasy novel, and the other is a historical fiction adult novel. Do you have hobbies that don’t involve writing or reading? I like to make my own swag. I find it relaxing. I also enjoy decorating cakes. I make the cakes for my children, as well as my nieces and nephews. We have a soft-coated Wheaten Terrier/Poodle mix named Clyde and a tank full of fish. Coffee or tea? Juice or Soda? Money being no object, what is your dream getaway? My ears are double pierced. I also have a Claddagh tattoo just below my collarbone. Do you have a favorite television series? Grimm. I love how unique the series is. And Nick Burkhart is a cutie. If you could be any animal (living or extinct, real or imagined), what would it be and why? So yes, dinosaurs and unicorns count. Unipeg, which is a cross between a unicorn and a pegasus. In grade school, I was pretty much obsessed with drawing unipegs with rainbow manes. When readers contact me and tell me how much they loved my book. It absolutely makes my day! Kelly Risser knew at a young age what she wanted to be when she grew up. Unfortunately, Fairytale Princess was not a lucrative career. Leaving the castle and wand behind, she entered the world of creative business writing where she worked in advertising, marketing, and currently, eLearning instructional design. When Kelly is not immersed in the middle of someone else's fantasy world, she's busy creating one of her own. Never Forgotten is her first complete series, which includes Never Forgotten, Current Impressions, Always Remembered, and Sea of Memories, a novella collection. 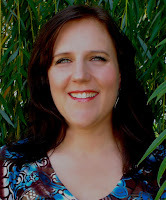 Kelly is one of the authors of award-winning Fractured Glass and 7: The Seven Deadly Sins. She also has a short story in the Twists in Time anthology, and will be part of several other anthologies releasing in 2016. You can visit her at www.KellyRisser.com. Sign up to her newsletter. After losing her father, Emma Bennett moves to her aunt's small town of Westport to finish out her senior year of high school. Emma wants to forget the pain and loss of the past few weeks, and finds relief in the company of Ben Parker—a local boy who she has an instant attraction and uncanny connection with. When Ben seems a little too preoccupied with other responsibilities and has no time for her, Emma turns to the town's hottest flirt—Lucas Crandon, for affection. Unfortunately, she realizes a little too late that sometimes bad boys, really can be bad for you. Admittedly, Sandy is addicted to coffee and dark chocolate, and is obsessed with all things paranormal. She records more movies and television shows than is humanly possible to watch in a lifetime, and swears there's a ghost in her house. When not writing, Sandy can be found curled up on the couch nose-deep into a book, or trying to catch up on that recorded season of some paranormal series. 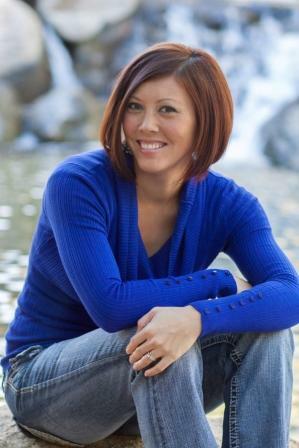 Sandy graduated from the University of Wisconsin-Oshkosh, where she majored in marketing. She spends her days managing corporate client programs, and her nights and weekends drafting new plot lines in spiral notebooks. She resides in southeastern Wisconsin with her husband, two children, and an energetic puppy. Guarding Brecken Shaefer-a dark and dangerous rebel-is harder than it looks. Death was nothing like sixteen-year-old Alisa Callahan thought it would be. Resting on pink, fluffy clouds for eternity with her gram and best friend sounded like a dream come true. After all, enduring one torturous experience after another in her short life deserved some kind of reward, right? Unfortunately, eternal rewards aren't given out so freely when you take your own life. Required to pay the debt for committing suicide, Alisa must become a guardian. It sounds easy enough, but not when the boy she is forced to protect has a dangerous secret and wants absolutely nothing to do with her. Brecken Shaefer isn't any normal teenager. He has special gifts that are sure to make Alisa's afterlife miserable. When feelings develop between them, everything spins out of control. Not only must Alisa face her own demons- but to protect Brecken, she must face an evil so heinous that it threatens to destroy their souls completely. Alisa is tired of hiding from her past. When the easiest thing to do is run, can Brecken give her the strength to stay? ​This is it. This is my moment, and I'm not going to let some stupid boy and a bunch of his idiotic friends scare me into failing. Closing my eyes, I float through the closed door, letting myself enjoy that slight pull on my soul as I meld with the wood for one second, feeling its aliveness, its purpose. This is one part of being a spirit that is genuinely cool. Everything is alive. Grab Reluctant Guardian for FREE! The third book in the Ransomed Souls Series, The Undoer, is coming out this spring! It’s by far my favorite out of any books I’ve written! Name 5 of your favorite movies. The Count of Monte Cristo, because Jim Caviezel is beautiful and I love how it’s a story of redemption and coming back from your lowest point (which I too have had to do). The Lord of the Rings, and do I really need to explain why? LOL The Hobbit, because I love Lord of the Rings. Princess Bride, because it’s a classic with some of the best one-liners ever written. I could watch it over and over. Pitch Perfect, because I’m a music buff. I used to be a music major in college. I sing, play guitar and piano, and used to write music. Now I write stories. Dang! I can’t even think of one! I can think of a bunch my husband has though! I love, love, love Invictus. But I have quite a few I like. My grandmother and mother were both wonderful poets, so I have that talent flowing through my veins if I ever put it to good use. What is your best advice for aspiring writers? Thank you SO much for having me on your blog! Check out my other books and enjoy the ride! !